Want to stop school shootings? Cold? A gun locker at every high school, secured by the local national guard. Daily classes for every student with parent permission, and guard approval, preparing them for armed response. Twenty trained, rifle-wielding 17-year-olds could stop even a team of invaders. Most people have no idea what science is. NOTHING is ever certain to a scientist. Scientific models are ALL theories. They claim causality in certain domains to specific tolerances, until somebody proves otherwise. Science is NEVER settled, and consensus matters not, only repeatability of experiments. If you're attempting to force somebody to go along with you by saying, "science says", you do not understand science. That's politics, not science. Scientists are always uncertain, always looking for holes in their theories, always looking to make their theories better. They always know that no matter how good a scientific theory, it is still only a meager approximation of reality. As an online discussion between statists and anarchists grows longer, the probability of a statist inviting an anarchist to move to Somalia approaches one. I wrote a short screed, entitled Why I Hate Cops. It's not at all nice. In response to this Slate article, I wrote another 2A screed. Nothing new here, for me, but a for-some-reason necessary reiteration of the obvious. I won't pretend that this comment will change the author's mind. He's stuck in progressive wonderland, where words mean what he wants them to mean. But it may embolden some lurkers. Unlike much of the slime that oozes out of DC these days, the Constitution was written in plain language. "Shall not be infringed" is the strongest restriction on state power in the entire document. It means exactly that. The state may place no limitations whatsoever on the right of the people to keep and bear arms. That means every single gun control statute ever passed, federal, state, or municipal, is unconstitutional on its face, hence null and void. The National Firearms Act (NFA), the 1968 Gun Control Act (GCA), the 1986 machine gun ban (FOPA, so-called Firearm Owners' Protection Act), the Brady Bill, Feinstein's new "Automatic Gunfire Protection Act", all of them, null and void. The militia clause means that infringing on the right of the people to keep and bear arms is treason. What else do you call an act that endangers "the security of a free state"? 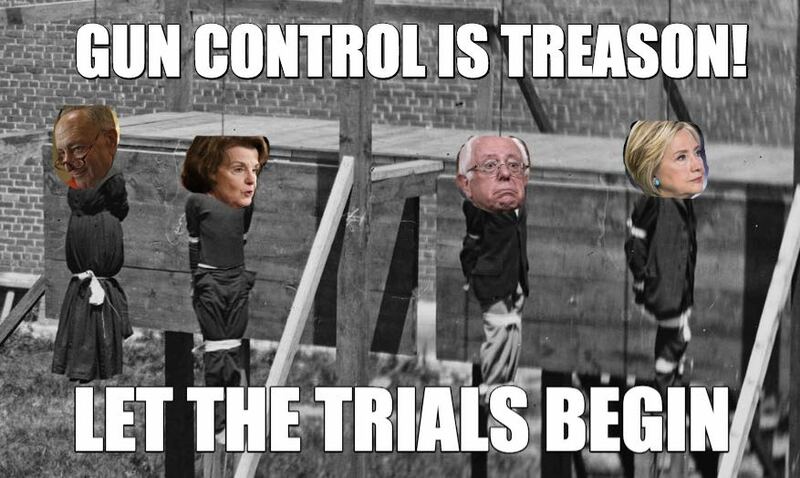 Treason is a capital offense. But it doesn't even matter. The Bill of Rights does not create any rights. It simply highlights important pre-existing rights, and attempts to remove them from the domain of legislation. A right is supposed to be something that no legislation may impede. But one of the fears of that time has occurred, and many, even those who support particular amendments, see the Bill of Rights as the source of those rights, not merely a high wall telling legislators, in impossible-to-misunderstand-unless-you're-a-lawyer language, "Thou shalt not venture herein." As a living being, I have a right to defend my life, and the lives of my loved ones, using whichever tools I find useful for that purpose. I have a right to defend my life from aggressors of all stripes; badges and titles make no difference. A gun is the most useful tool invented to date for that defense. If you would deny me access to guns, any guns, you are denying my right to life. How dare you. Real Climatologists: "If Global Warming Is Irrefutable, It's Not Science, It's Religion"
Their Principles page says something I've been saying for a long time. Climate is a complex non-linear system far from equilibrium. You cannot predict such a system, long-term, you can only watch it and see what it does. We are the most qualified real climatologists to ever come out as global warming skeptics, including even more than Dr. Richard Lindzen, Dr. Judith Curry, and Dr. Roy Spencer, although we acknowledge their courage. We only came out after President Trump was elected because before that it seemed futile. Unlike most scientists counted in the scientific consensus on global warming we are real climate scientists. Our graduate careers included numerous courses in climate and we have done extensive research in climate, including climate modeling and climate proxies (past climates). Doing both is unusual. Not only have we actually used and run climate models but we have actually programmed them and so fully understand their (huge) weaknesses. Unlike many we don't just ignorantly use the climate proxy data produced by others but we have taken courses and done research on climate proxies and so fully understand their (huge) weaknesses. For those, mostly non-scientists, who are foolish enough to believe (and espouse) that peer review means that what is written is true, every word one of us writes is actually read by the other before publication. Scientists today often don't have time to even scan the current literature, never mind carefully read papers for peer review. Often a peer reviewer simply looks at the reputations of, or if he is friends with, the paper's authors to decide on whether the paper should be published. This is especially true for scientists who are non-native English speakers since English is the language of science and reading English carefully is a tedious task. We don't get paid by the oil companies or anyone else to question global warming. We are not disgruntled employees. We just think climate science is one of the most fascinating sciences there is and to turn it into a lie for career advancement and political purposes is unconscionable.